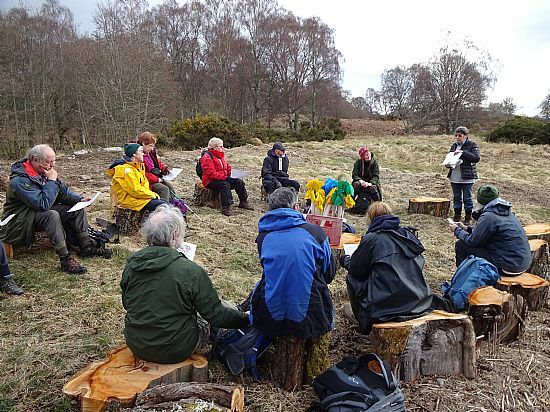 Although one of the main aims of the TARRADALE THROUGH TIME archaeological project is trying to find the traces of people who lived in the Tarradale area thousands of years ago, it is also interested in our more recent ancestors. There are a number of ruined and abandoned cottages on the edges of fields in the local area and TTT has just finished locating and surveying the remains of a group of houses 200 to 250 years old. This latest part of the overall project was designed to be a simple exercise in locating and planning the sites of old houses, but archaeology of any period is never straightforward and our investigation turned into an unexpected mystery. 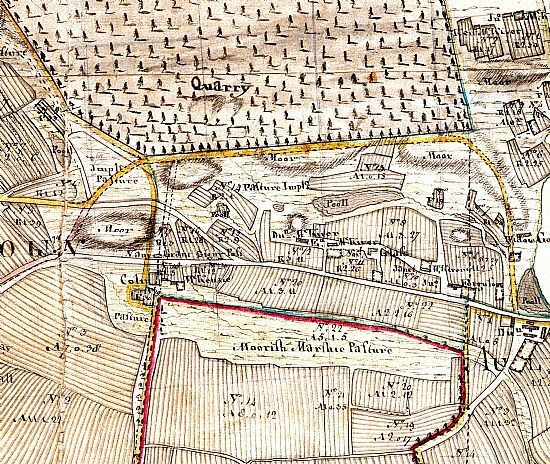 In 1788, Dr Kenneth Murchison, the owner of Tarradale, commissioned David Aitken a surveyor, to make a map of the whole estate with the intention of instigating a number of agricultural improvements. The 1788 estate map is a detailed document showing fields made up of parcels of rig and furrow some of which probably had a much earlier origin but superimposed on top of that were outlines for bigger fields that were being created for enlarged and improved farms. Using the map as a guide, the TARRADALE THROUGH TIME archaeologists realised that Aitken had accurately depicted what he saw on the ground and we wondered whether some of the many smallholders’ houses he clearly marked on his map were identifiable today. Aitken’s map shows a group of buildings lying immediately to the south of the Tarradale bends on what is now the A832 and north of Tarradale Mains farm. The settlement was not separately named but the contents table on the map described the area as being “In 19 separate fields possessed by 11 mailers lying north of the Mains” Our desk based research on the map suggested that five houses and some small fields lay within the wooded area just south of the A832, opposite the old quarry. Our first visit to the site was disappointing as we could only see two possible houses and one enclosed field with a lot of bracken, whins and tussocks of grass hiding everything else. 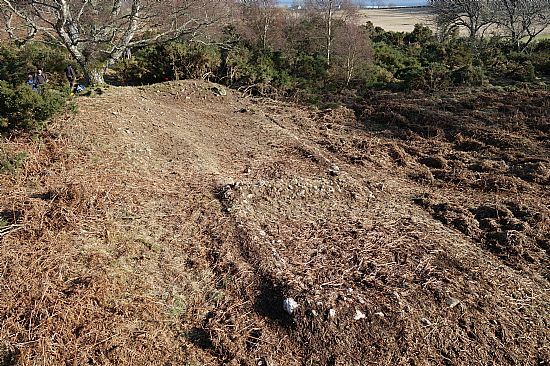 With the permission of Tarradale estate we removed some of the whins before the nesting season and after a great deal of strenuous clearance work we revealed six houses and four enclosed fields and lots of other interesting features. At the beginning of April we spent nearly a week planning the site and discovering all sorts of things about the kind of houses poor tenants lived in more than 200 years ago. The map helpfully gave us the names of all the tenants in 1788 and in the specific area we were investigating we expected to find five houses belonging respectively to Duncan MacKiver, Euan MacKiver, Norman Glass, Janet MacKiver and John Ferguson. Because these tenants had been described as ‘mailers’ we also began investigating what was meant by that kind of tenancy. A ‘mailer’ (also spelt ‘mealer’ although it has nothing to do with meal but rather mail meaning rent) was a poor person who was given or broke in from the moor small patches of arable on the margins of the best land. They paid their rent in money, in labour service and in kind. For example, in 1791 Alexander Mackay paid 8 shillings and 8 pence, did 16 days work on the estate and gave 2 dozen eggs and 2 hens per year as his rent for an area of land only extending to 1 acre 2 roods and 1 fall (there were 4 roods in an acre and 40 falls in a rood). Describing poor tenants as mailers was common in Ross and Cromarty at this period but in other estates and in different areas they could be simply described as cottars. Several people spent a lot of time in the Highland Archives Centre looking for further evidence of our mailers. There is a rental list of Tarradale mailers dated 1791 but none of the tenants in our study area could be identified on the rental compiled only three years after the map was constructed. It could be that the 1791 rental does not list the mailers in our area but instead concentrates on the upwards of 50 tenants who had small plots of land further north in the area now known as Muir of Tarradale. Alternatively, our settlement might have been abandoned by 1791 which of course raises the question of why they left. The proposed agricultural improvements indicated by the 1788 map and the building of the new Tarradale Mains farmhouse in the early 1790s may have been important in the movement or relocation of the tenants. By the time of the first census in 1841 the settlement was long gone and it was not depicted on the First Edition Ordnance Survey maps of the 1870s and 80s so it had already disappeared into the landscape. A further complication was that the 1788 map clearly shows five tenants’ houses in the area we were investigating but on the ground we found the remains of six houses. Four of these houses (those belonging to Duncan McKiver, Norman Glass, Janet McKiver and John Ferguson) were located exactly where we expected to find them from the 1788 map. We found no trace of Euan McKiver’s house on the ground but we found the remains of a house just to the west of where we expected Euan McKiver’s house to be. We are pretty sure that Aitken was very accurate and in any event the outline of the house we discovered was different to the house of Euan McKiver shown on the map as we also found a range of separate outbuildings not recorded on the map. To add further to our difficulty in correlating the field evidence with a map, we found an additional larger and well-built house some distance to the west of Duncan McKiver’s house on what is shown as arable land on the 1788 map. Four of our six main buildings were completely hidden under whin bushes but the walls of the buildings were quite visible once the whins were removed. A further two buildings are in very tussocky grass and have not been exposed. Once we had cleared the main buildings we began to investigate their dimensions and design. In general they are about 16 metres long by about 5 metres wide and lie roughly east-west. This is quite large for poor tenants’ houses particularly as the buildings do not seem to be ‘long’ or ‘byre’ houses (which are represented today in the black houses of the Western Isles). The houses we uncovered appear to have one of two main rooms with ‘outshots’ or smaller attached buildings which so far we have interpreted as housing for animals or for storage. The houses all have some stone foundations but they are not as substantial as other houses of this period and these houses were almost certainly built by the tenants themselves. This led us to consider whether the houses were built of turf or clay set on a low foundation of stones and with a turf or thatched roof. Research into clay houses in Ross and Cromarty yielded several references to ‘clay masons’ in the early 19th century census returns so clay houses were evidently still being built. At this point we decided that we did need to understand the construction of the houses. The most visible house was house 2, belonging to Duncan MacKiver on the 1788 map. We dug a narrow trench from the front wall to the back wall which was built into the slope of rising ground. The front wall, although built with relatively small stones, was well built and bonded with clay. The back wall was very ruinous but as with the front wall there was a considerable spread of stones and clay across the interior of the building. So far the evidence we have found has not led to a definite conclusion that the house was built wholly of clay above the scanty stone foundations, or of clay and turf, but from the amount of clay we discovered it was clear that clay played an important in these structures rather than their being completely built of stones which we tend to expect of cottages in the Highlands. We excavated a small area in the interior of house 2 to reveal a clay floor which suggested that it was a domestic building and this was further evidenced by some finds of broken glass including one piece that may have come from the glass shade for an oil lamp. This is slightly surprising as it is a reasonably expensive article for our ‘poor’ tenants to own when most lamps at that time would have been simple metal containers with a floating wick (known as cruisie lamps). We found several fragments of cast iron cooking pots around the site which would have been a costly buy and these often do not survive as they could be recycled as scrap metal. Perhaps we are seeing the end of the use of the site when broken articles were abandoned as the tenants left for better opportunities elsewhere. However, we found very few pieces of pottery suggesting that either the inhabitants were too poor to afford much or else they took their precious ceramics with them when the properties were abandoned though we would still have expected to have found more broken pottery unless the site was not occupied for very long which is a distinct possibility. Although it was fascinating to find and research the four buildings we found on the ground that could be correlated with buildings on the 1788 map, these by themselves do not constitute a huge mystery. The mystery lies in the two extra buildings we found on the ground which were not on the 1788 map. As mentioned above we found no trace of Euan McKiver’s map on the ground though we did find a building about 20 metres away just to the east of Duncan McKiver’s house. However, the most significant find was a fairly large building a short distance to the west of Duncan McKiver’s house and which was clearly not there at the time of the 1788 map and this strongly suggests that it was built later. The map shows agricultural ground where both these additional houses were found so they must have been built after the map was made but both had essentially disappeared by the time the Ordnance Survey maps were made. One possible explanation for the additional house to the west is that it was constructed at the time Tarradale quarry was reopened in the early 19th century, and it is just possible that house 2 was also reoccupied at this time which would explain the presence of part of a glass paraffin lamp shade there. So what we expected to be the straightforward recording of the buildings we could see on the 1788 map turned into a bit of a conundrum with much initial confusion trying to relate the houses on the ground to those on the map and eventually coming to the conclusion that although the map is accurate, it is a snapshot in time and we were seeing a multiperiod landscape with houses of different ages and with the two additional houses we found perhaps representing a later reoccupation of the site connected with the development of Tarradale quarry. This was a very successful exercise, and true to TARRADALE THROUGH TIME’s subtitle Community archaeology in the Highlands, we were able to engage with a number of local people who helped on the site as well as with the large number of people who visited on our open day and with a subsequent visit by pupils from Marybank primary school. A full report on our findings and survey will be sent to the national and local Historic Environment Records so that anybody can see what we found as well as our thoughts on the lives of the people who lived in the settlement. As part of the overall TARRADALE THROUGH TIME project, we will be excavating two older archaeological sites between 8 and 22 September 2018 and if you would like to join us or would like to be kept informed, email us at tarradalethroughtime@gmail.com. The above is a copy of an article that first appeared in Muir Matters Issue 54, 2018.